I was in the Grandfather District of the Pisgah National Forest the other morning preparing to go to one of my Forest Service bird points when I noticed two tall white flowers at the edge of the woods. My first thought was fly poison, Amianthium muscaetoxicum, but then I thought it’s a little early for fly poison; I ventured over for a closer look. I found two, nearly 3-feet tall, stalks with terminal racemes of white flowers about 5 inches in length. So at a distance, there is a resemblance to fly poison but upon closer inspection there were obvious differences. 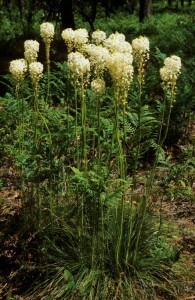 The lily I had stumbled upon the other morning is known as turkeybeard or eastern turkeybeard, Xerophyllum asphodeloides. It gets its common name from the wiry grass-looking clump of basal leaves that, with a little imagination, could resemble the “beard” that protrudes from the breast of Tom Turkey. The basal leaves of fly poison are a little more lily-like – flat and up to 3/4 of an inch wide. Turkeybeard also has long (4-5 inch) needle like cauline (stem) leaves that are smaller near the top of the plant. The cauline leaves of fly poison are only about an inch long. 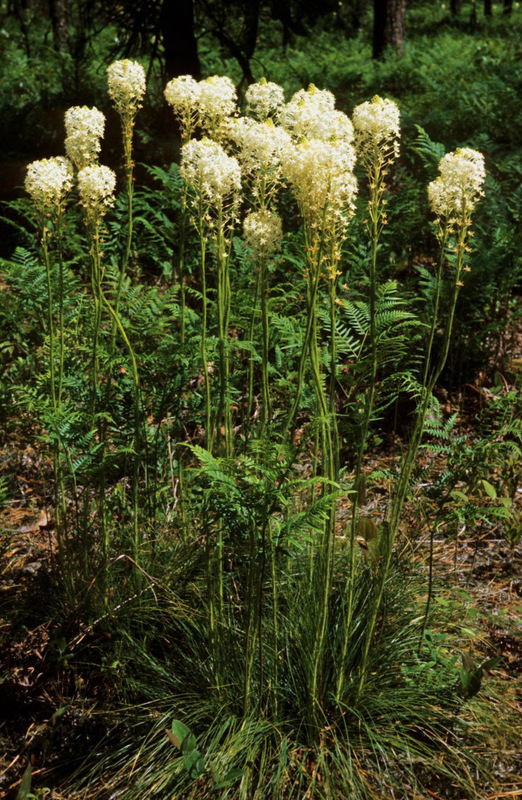 The genus Xerophyllum has two North American species, X. asphodeloides (turkeybeard) in the east and X. tenax or beargrass in the Northwest. Turkeybeard is found in two disjunct and at first glance, totally different habitats. It is found in the pine barrens of southern New Jersey and in xeric (dry) oak and pine communities at mid to high elevations along the Southern Appalachians from Virginia and West Virginia through the Carolinas to Georgia. There are historic records from Delaware and Kentucky. While these two habitats appear to be opposite ends of the spectrum, they actually have a lot in common. They are both composed of dry, acidic, sandy or rocky soils and share other same or similar plant species like blackjack oak, pitch pine and blueberries. Turkeybeard is recorded from 41 counties across its range. It is endangered in parts of its range and has been included in the U.S. Center for Plant Conservation’s National endangered Plant Collection. Turkeybeard is well suited for its dry environment. The genus name, Xerophyllum, means “dry-leaved” and the thin coarse leaves conserve water by minimizing evaporation. In the Southern Appalachians, Turkeybeard is most often found on west or northwest-facing slopes and its primary source of water is from rain and/or fog. Recent studies by Norman A. Bourg and others at the University of Maryland have shown that turkeybeard seems to benefit from fire and suggests that it could be fire-dependent. The plant’s large rhizome could allow it to store water and become dormant underground where it could survive a fire. Seeds collected in 1988 by the New England Wildflower Society were still viable in 1995 suggesting that turkeybeard is capable of seed-banking, so there would be seed available after a fire or other disturbance. The fire scenario fits well with the turkeybeard I discovered in Grandfather the other day. I’ve been doing that point since 2007 and I enter the woods at the same point every year and within a week or 10 days of the same date and this is the first year I’ve seen the flowers. I could have walked by the basal leaves without noticing them but there’s no way to miss the flowers. And there was a fire a couple of years ago. I don’t know if it was a wildfire or a controlled burn but there were no flowers in the years before the fire but lily is definitely present now.